Rules for summer: Get outside. Sit down. Breathe deep. Grab a great book. Read. We've got the last two covered! Here are six books that are page-turning, heart-racing, nail-biting thrillers sure to keep you riveted. Read them in blissful solitude or find a few extra chairs and invite your book club to read and discuss with you. Then you'll be following one last summer rule: Spend time with friends. All are recently published in paperback and come with discussion guides; they are also available in hardcover and ebook. Over 3,000 people died on September 11, 2001. With the impact of that catastrophe being so far-reaching, it's no surprise that there have been a plethora of films and books released that recall 9/11. Oliver Stone's World Trade Center and Paul Greengrass' United 93 are two of the most popular movies to recreate that day. Jonathan Safran Foer's Extremely Loud & Incredibly Close, an outstanding novel about an eccentric nine-year-old boy trying to piece together a puzzle his father left behind after being killed in the World Trade Center, is another title that might be familiar to those who seek out art related to America's contemporary history. But these well-known works aren't aimed specifically at younger readers, and there was certainly no shortage of teenagers impacted by the events of that day. Thankfully, there are books that give a focused teenage perspective on the events of 9/11. Wendy Mills' All We Have Left, which follows the lives of Alia and Jesse, two teenage girls from very different walks of life, is one of these special books. Mills' takes readers on a journey that looks at Alia's young Muslim life, as well as Jesse's more narrow-minded view of the world. When the two stories collide, readers are rewarded with an emotionally rich conclusion that's tear inducing. For this Beyond the Book, I scoured the library's bookshelves to uncover some lesser-known YA titles about 9/11. Each of these titles offers a unique perspective on one of this tragedy. There will be tears, for sure, but these YA novels are more than worth the emotional commitment. If you are searching for 9/11 YA fiction, look no further. One narrative can never fully represent any cultural experience but becoming aware of singular stories helps us find empathy for a wide range of the world. Here we have gathered a variety of stories that together explore a diverse representation of Korean perspectives, history and life situations. Today, we look back on the incredible selection of books our members have reviewed for First Impressions during the year - 45 titles in total. Reader reviews abound on the web these days but it's difficult to know which to trust, especially when there are businesses who will arrange for glowing "reader reviews" to be posted and other reviews may be written by well-meaning family and friends. BookBrowse's First Impressions program offers you a source of trustworthy reader reviews because only BookBrowse members can post reviews. Members indicate which books they're interested in but cannot prioritize, and copies are assigned by BookBrowse's algorithms. So, while it's conceivable that somebody connected to the book might be assigned a copy, the chances of there being enough people to influence the overall consensus is effectively non-existent. 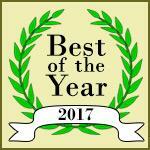 BookBrowse's annual Best of the Year awards are an excellent barometer of great reading. The awards are particularly noteworthy because voting is only open to BookBrowse subscribers - so no vote stuffing by rabid fan bases; and instead of just voting for a book (which favors the most widely read books) subscribers rate each book they've read that is on the shortlist, and the winners are the books with the highest overall rating. Such considered selection results in truly outstanding books being feted every year. 2017 is no different in that regard. Over 7,000 votes were cast on 67 books (12 nonfiction, 51 fiction and 4 YA). Yesterday, George Saunders won the Man Booker Prize for Lincoln in The Bardo. So you might be wondering what the bardo is! Find out in our "beyond the book" article. You can also read our review and browse an excerpt. The word bardo comes from the Tibetan Buddhist tradition and means "in-between." It refers to a transitional state when one's awareness of the physical world is suspended. According to Spiritualtravel.org the concept is an "umbrella term which includes the transitional states of birth, death, dream, transmigration or afterlife, meditation, and spiritual luminosity...for the dying individual, the bardo is the period of the afterlife that lies in between two different incarnations." Most of the characters in Lincoln in the Bardo are in this latter state throughout the novel, stuck between life and whatever awaits them beyond.